Having proposals that need to be renewed each year gives you a great opportunity to re-connect with your clients to discuss their needs, any price increases and also up-sell any new products. Every proposal created in Practice Ignition has a start and end date, so we recommend around two months before the end date, you roll over your proposals, ready for the next financial year. 1. 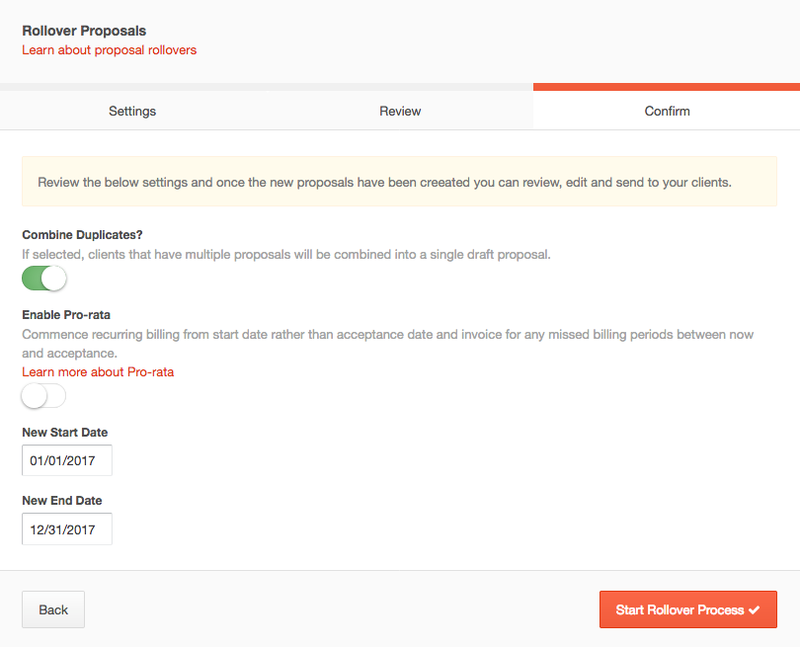 Go to the Proposals menu and click the Rollovers button. 2. This will open up a slider from the right-hand side prompting you to choose which proposals you want to create rollovers for based on their start and end dates. It will bring up a list of all proposals which have started on or after the Start Date Range, and also all proposals with an end date on or before the End Date Range. 3. You will then be shown a list of all the proposals which fall within this date range. You can click the Download List (CSV) button to view the details of these proposals on a spreadsheet. You also have the option of deselecting any proposals which fall within this date range that you don't want to be rolled over. When you are happy with the selection, click the Next Step button. Combine Duplicates - If you have one entity (i.e. client) with multiple proposals during the selected date range, turning this toggle on will combine the services of all the proposals into a single proposal, avoiding the creation of any duplicates. Note: When combining multiple proposals, it will use the settings of the earliest proposal. You also need to choose a new start and end date for your new proposals. We recommend your start date to be the day after the end date of your last year's proposals, and the end date to be 12 months from the new start date. When you have finished editing the settings, click the Start Rollover Process to finish creating the new draft proposals. 5. You can now click on the Draft folder of your proposals to see all the newly created proposals. Tick the proposals you need to review, then click Bulk Actions > Mark for Review to initiate the review process. Note: If you have a lot of draft proposals, use the Filters within this folder and use the Starts After option to bring up the proposals for the new financial year. You will then be able to select all with a single tick of a box in the header row. 6. The Mark for Review process will open up each proposal and allow you to amend them before sending out to the client for acceptance. Should you need to change the services included, adjust the price, or update the Engagement Letter template, click the Edit Proposal button. When you're done editing the proposal, click the Mark for Review if you wish to send out all proposals in one go, or Leave As Draft button if you need more time to review the proposal. Selecting either option will then open up the next proposal for editing. Alternatively, you can also click Actions > Sent to Client to immediately send the proposal to the client. 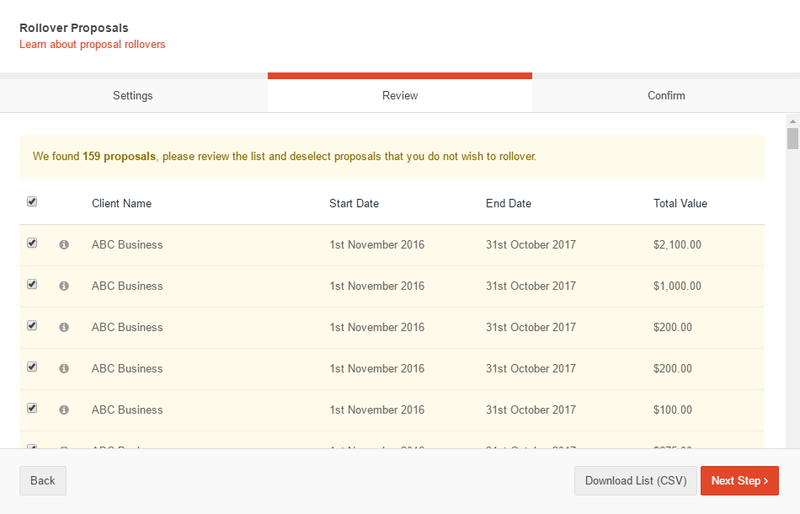 If you chose to bulk send, after the Mark for Review process has completed, we'll automatically show you all proposals In Review. Here you can now select all proposals you wish to send out. A Bulk Actions menu will appear at the top, where you can now choose Send Selected.